Welcome to my return flight (SGN-SIN) on Vietnam Airlines Airbus A321 trip report! One of the Airbus A321s in the fleet wears this Skyteam livery. 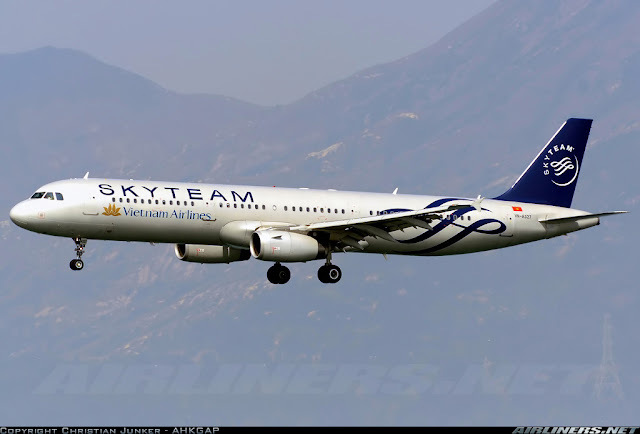 I did quite a lot on of trip reports on this airline, covering as many aircraft type as possible for the Airbus A321, this will be my last trip report on it. I hope you enjoy the reviews so far. 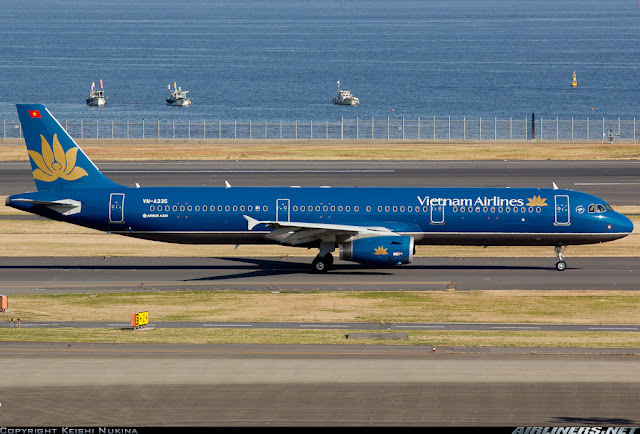 Flying with Vietnam Airlines so far, I have been quite underwhelmed by the cabin service and finally for the first time possibly, I experienced a much better set of crew on this flight, something worth mentioning about. So sit back and relax and enjoy this trip report! I used mainly Foursquare which helped me find the best eating places in Ho Chi Minh City. Something caught my eye, guess what is it? This city is dominated by motorbikes - they are everywhere! Cheesecake Cafe - it was vacant at that time and I managed to get quite a bit of work done. Look at the amount of cable!! Side dishes to be ordered separately - quite an expensive meal but worth it. As my ticket doesn't allow seat assignment until 24 hours before departure, I had to do this quickly to get my desired seat. For short flights, I go for the window seat. It was my first time departing Ho Chi Minh in the afternoon, usually its early in the morning. A good change as I didn't have to wake up early to rush to the airport. The normal queue was long, fortunately the web check-in queue had only a passenger at the counter so after 2 minutes of waiting, I was at the counter and got the boarding pass not long after. You should have seen the faces of some of the waiting passengers - priceless. Free Wifi at the airport and its available at every part of the terminal. Look at the queue! I was glad to have checked in online. I wish I was on this airline instead, won't mind flying to Taipei, one of my favourite cities in Asia. 8th passenger to check in, another flight from SGN to SIN, this route is becoming a routine for me. EVA Air's newest Boeing 777-300ER was at the airport, getting ready to push back. I like the new livery, do you? My lunch at the airport, it was quite expensive. U.S$8 for this. Spotted Vietnam Airlines Boeing 787-9, VN-A867 taxing to the runway for departure to Hanoi. Another EVA Air Boeing 777-300ER was spotted, this time it was B-16712 being prepared for departure to Taipei. Quite crowded as most of the passengers were Taipei bound. Heading down the escalator, it means one thing, my aircraft was parked at a remote parking lot. True enough, this was my 2nd time departing from one of these gates. The bus ride took around 15 minutes and we passed by a couple of new A321s (VN-612 and VN-614), I was hoping to get either one of them, but disappointedly we passed by them and stopped in front of this aircraft. Thankfully it was a new registration for me. First time boarding the Airbus A321 via the staircase, I managed to snap a few shots of it. As long you do it quickly, the airport ramp staff close one eye. 2 emergency doors between the 1st and last door means its an Airbus A321. This male crew was looking elsewhere, he didn't bother acknowledging me or any of the passing by passengers. Not many photos of the cabin, for reference you can check out my previous trip report over here. A choice of beef and fish for us to choose, I chose the former. It was decent, nothing special about it. Apart from one crew, the rest of them were warm and friendly, it was a surprise change from my previous flight experience with this airline. Most of them were enthusiastic and cordial towards the passengers and that's what service should be all about! Our flight departed late but the flight crew apologised us for the delay. Its strange that we pushed back on time but to another parking slot. We waited for another 15 minutes before engines were started, according to the Captain, we were delayed due to busy traffic at the airport . Once we were on the way, safety demonstration was done and the crew did their mandatory checks before departure. Take off was powerful and we had a good view through out. This time, the take off was not so bumpy as my previous SGN-SIN flight with Singapore Airlines. The flight was routine and the captain told us that the weather at Singapore was cloudy, no mention about thunder storm or turbulence during arrival. While for the in-flight service, it was normal and the crew including that one (failed to greet the passengers) were friendly. 2 trolleys starting from the front to the rear. The front distributed the food while the other one distributed drinks. The wait for our meal was around 25 minutes after departure, not too bad. For most parts of cruising, it was smooth and once we started descending it got a bit bumpy (check out the photos below) and the passengers got to witness a lighting display (nearby to where we were flying), I was hoping that we didn't have to fly into those clouds. We were placed into holding pattern for a while (smooth ride) but once we were out of it, the ride got a bit turbulent and it got worse as we got closer to the airport. Lots of shakes and a few down drifts causing quite a few "wooooo" but nothing serious. Everyone by then was seated with the seat belts fastened and that's important. The flight crew were rely on the automated autopilot system until to the final approach when one of them was to manually fly the plane and land on the wet runway. It was a smooth landing and some of the passengers were relieved to be on the ground. My seat mates were Korean and they were quite nice especially the lady beside me. We spoke no English but we understood our hand signals especially during turbulence and the sight of the lighting. Although the ride during descending was slightly nerve whacking but I enjoyed it compared to my other flights with this airline. I won't mind flying back with the crew if I was given a choice. 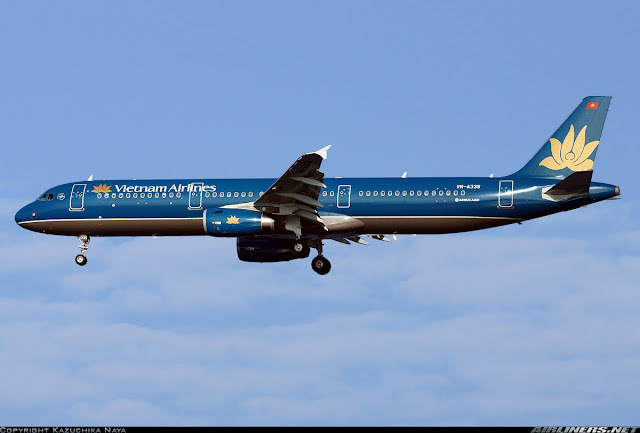 I wanted to fly on VN-A614! Until next time. It was my first sight of VN-A888. This means I have saw all 4 of them at this time. The airline will take delivery of another 10 more. The airline's another A321 just landed and was exiting the runway. At this point, we started seeing the 'lighting' display! Taxi to Terminal 3 took around 15 minutes, so we ended up at the gate quite late, not the airline's fault. When it comes to mother's nature, no one can do anything about it. For locals, we used the automated machine and that takes less than 2 minutes to get through. That concludes the end of my trip to Saigon. Always looking for new ways to get there! Stay tuned for my next trip report. This has to be one of the best flight service I had with this airline and I asked myself, why can't most of the crew show some enthusiasm just like this set of crew. They were cordial and friendly towards each passenger, serving us with smiles on their faces. Not quite the SQ or CX standard but it was something that made me wonder whether I was flying on Vietnam Airlines. This airline has a good safety record and new aircraft (A350 and B787), the Airbus A321s are quite young in fact, with the oldest around 4 years old so it's fleet is quite modern compared with other Asian airlines. Cabin product is inconsistent and that's what the airline needs to work on, to standardise the new aircraft especially. Why did this airline have different configuration on the 787 (no Premium Economy Class on two of the 787 Dreamliner aircraft, VN-A865 and A866?) No one outside the airline knows so it is down to "lottery" if you are flying long haul to let's say London because if you book yourself on Premium Economy and if you get either VN-A865 or A866, you are most likely get bumped into Economy Class if the Business Class is full. Airbus A350 (VN-A886 to A889) have different cabin products to the 787 Dreamliner but stories have been circulating that VN-A890 onwards would have cabin products similar to the 787 Dreamliner and hopefully the Premium Economy would be fitted with 2-3-2 instead of the 3-3-3. My next ride with this airline would be on the Boeing 777, stay tuned for the trip report. Just had I flight with 772 couple days ago, and I was surprised that Y seat is much more larger than those in 789 and 359. However, it is terrible in J.
I booked myself on VN's 777 for both ways but aircraft changed to A330 and B787 (VN-A866), stay tuned for my trip reports on these 2. Going to try again in August/September. Oops, looks like you are not the only one that got aircraft changed! That's life! Anyway, just heard news that VN-A863 has hit the jet bridge at Hanoi, it means one less Dreamliner for a while. Sad! Instead of getting 332, i got 777 for both flights. So sad! I will have SGN-NRT tonight in J thanks god no aircraft change at this point. HAN-NRT is now switched to 330 for sometimes from now. So happy they decided HAN not SGN haha. I just check the seat map and my friends who sit behind me will end up getting premium economy seats. Haha! They are going to use the aircraft for London and Frankfurt. That is very unlucky! Last minute aircraft changes and anything changes from a wide-body to an A321 is a huge disappointment. I guess your flight was full, right? Better luck next time! On my previous flight (HAN-SGN), my flight was changed from the 777 to the 787 and according to the staff, I was supposed to fly on the A350 but when the bus transported us from the terminal to the aircraft, it was 787 (VN-A866).